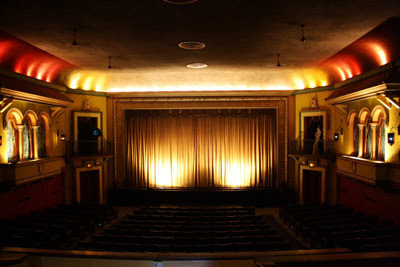 Cinemablographer: Help Ottawa's Historic Mayfair Theatre Buy a Digital Projector! Help Ottawa's Historic Mayfair Theatre Buy a Digital Projector! Apparently, it’s Indiegogo week here on Cinemablographer! I went to see Killer Joe at The Mayfair last night and noticed a sign on the box office window advertising a campaign to help keep Ottawa’s most historic movie theatre in business. At a ripe 80 years, The Mayfair is among the oldest independent movie houses in all of Canada. Like all movie theatres, though, The Mayfair is being forced to go digital. They’ve held out as long as they could, but the industry is forcing even the most devoted of cinephiles to drop film for digital because studios and distributors will no longer be making or shipping film prints. It’s digital or die. The Mayfair has been raising funds for a Digital Cinema Package (DCP) for a while now with fundraiser screenings and a handy jar at the concession stand, so they’ve raised quite a bit. They just need your help to make the final push. With the help of Indiegogo, The Mayfair seeks $15, 000 towards the purchase, shipping, setup, and installation of the projector. Every little bit helps! However, for those of you who can afford to be extra generous, The Mayfair has some extra rewards for charitable film buffs. Among the offered perks are a “candy bar embiggening card,” a chance to put your name on one of the theatre’s seats, the opportunity to present a film of your choosing, a guaranteed seat on the couch (yes, The Mayfair has a couch! ), and a platinum card that gives you free movies for a year. Help save The Mayfair! Its history and charm make it a cornerstone of Ottawa’s film community. The Mayfair has a sense of character that you won’t find anywhere else in town. And at a low cost of $6 a ticket for members, which includes frequent double bills and the monthly event of Saturday Night Sinema (free for members! ), The Mayfair offers one of the best tickets in town. Bringing alternative fare to Ottawa movie screens, plus second runs of bigger stuff in case you missed it or want to see it again, The Mayfair is the place for film buffs in Ottawa. They’re the only place in town where you can see The Room every month of the year – it’s now in its 39th consecutive month! The legacy of the “Citizen Kane of bad movies” depends on you! Here’s to another 39 months of The Room… and many more! Win Tickets to 'The Impossible' in Ottawa!